Eagle Harbor community in Orange Park, Florida. Eagle Harbor is a beautiful 3,000-acre, family-friendly, planned golf community of traditional and contemporary homes situated on Fleming Island. Bounded to the east by U.S. 17 and to the north and west by Doctors Lake, Eagle Harbor extends south of County Road 220 and includes the new Clay County library on Town Center Boulevard. Just 20 miles from downtown Jacksonville and only minutes to Orange Park Mall and theaters, Eagle Harbor is bordered by Doctor's Lake, Black Creek, and the St. Johns River. 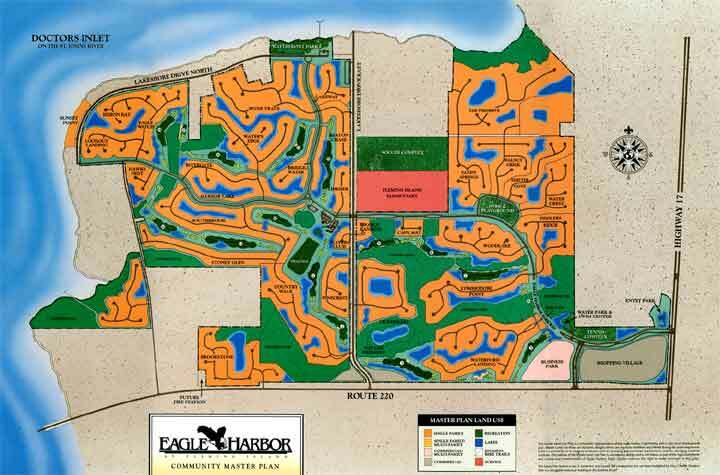 Eagle Harbor was chosen "Best Planned Community in Northeast Florida" by the Northeast Florida Building & Zoning Council and received the Southeast Builders Conference's 1998 "Grand Aurora" and "Aurora" Awards and the Florida Association of Realtors' 1997 Environmental (ENVY) Award. An unrivaled amenities center features a 185,000-gallon Superpool complex with a winding, 110-foot waterslide, 1- and 3-meter diving boards, a wading pool, competitive swim lanes, covered sitting areas and beach area with volleyball pit. 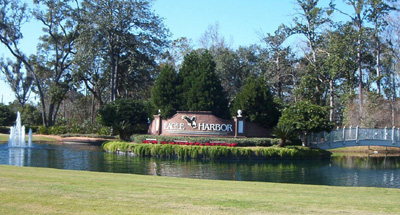 Eagle Harbor offers a variety of carefully planned neighborhoods with easy-to-maintain homes. There are club homes just a short walk from the clubhouse, patio homes, spacious conventional homes, and everything in between. Neighborhoods are connected by bike paths and sidewalks. Whether you're starting a family or just starting your second childhood, you'll find the ideal home in this community. When completed, Eagle Harbor will include 3,000 homes, 328 apartments and about 1 million square feet of retail and office space with plans for more commercial space including a movie theater, bowling alley and lodging for visitors to the area. See site map. Waterfront park on Doctor's Lake with an adults only heated pool, water playground, zero entry pool and separate toddler area. The homebuilders of Eagle Harbor are some of Florida's finest, and they've built their reputations over the years by giving buyers selection, design innovation, quality and value. Ask me about what each offers in Eagle Harbor.